What we’re looking at here is not just incremental progress in the treatment of a medical condition, but a fundamental change in the way this condition is understood in every aspect, from its impact on the patient to the way it’s managed to the expectations, on the part both of clinicians and patients, for patient outcomes. What has happened in the overall perception of rheumatoid arthritis in the past 30 years is an example of what can happen in disease management when things go right. Turning the clock back, let’s consider what was meant by “rheumatism” for many, many years, right up to the second half of the 20th century. Rheumatism was accepted as a common condition that affected mostly the elderly. It was characterized by fluid – “rheum” – in the joints. It caused pain, swelling, stiffness, and, ultimately, resulted in decreasing mobility. Old folks with rheumatism commonly hobbled about with canes and sometimes were confined to wheelchairs. There wasn’t a whole lot that could be done about it. Treatment was palliative, meaning that it was aimed at alleviating the worst of the symptoms. But palliative treatment was generally thought to be about as good as one could hope for, because, after all, nobody died from rheumatism. Or did they? Starting in the 1980s, evidence began to trickle out that people with rheumatoid arthritis were at significantly increased risk of death compared with people of the same age in the general population. A rheumatologist named Theodore Pincus caused a considerable stir at a meeting of the American College of Rheumatology (ACR) in 1984 when he reported that in a group of 75 patients with RA who had been tracked for 9 years, the mortality rate was about the same as in patients with heart disease blocking three coronary arteries – i.e., really severe disease. By the mid 1990s, there were lots of data showing that, in fact, rheumatoid arthritis did kill people – or, at least, that patients with rheumatoid arthritis were more than twice as likely to die as people of the same age in the general population. Exactly why this is nobody can say for sure. Without question, there are comorbidities with rheumatoid arthritis – cardiovascular disease, infections, diabetes, malignancies – but to what extent the underlying rheumatoid arthritis causes or merely contributes to these comorbidities is uncertain. However, one factor that cannot be underestimated is the lack of activity that is imposed on many patients with RA. But what became certain was that RA could not be considered a “benign” condition, with treatment focused only on managing the symptoms while ignoring the underlying progression of the disease. What is the impact of rheumatoid arthritis? Compared to osteoarthritis, rheumatoid arthritis is relatively uncommon. It’s estimated that about 50 million Americans have some sort of osteoarthritis, but only about 1.5 million adults in the US have rheumatoid arthritis. Another 300,000 young people have a form termed juvenile rheumatoid arthritis, which is of great concern. Usually, RA starts in mid-life or even later, but it’s by no means uncommon for people in their 30s to develop RA. This disease affects women about twice as often as it does men, and for unknown reasons, RA in younger women progresses faster than it does in most other cohorts of patients. The symptoms of RA first appear in the joints. Rheumatologists (the physicians that study RA, as well as a group of other diseases that have been classified as autoimmune – we’ll say something about that later on) have zeroed in on 28 joints that are typically affected by RA. Fourteen of these are the joints in the fingers and thumbs, and the other 14 joints include upper-body joints (wrists, elbows, and shoulders), and lower-body joints (hips, knees, ankles). The small joints in the hands are more diagnostic of RA than the larger weight-bearing joints, which are much more often affected by osteoarthritis, the result of bone-on-bone wear. The joint symptoms in RA consist mostly of swelling, pain, and stiffness. In this, they may be difficult to distinguish from the joint symptoms in osteoarthritis, where the joint damage can also result in severe inflammation. An important distinction is that in rheumatoid arthritis, the joint swelling – i.e., the presence of excessive amounts of fluid in the joint – precedes and may cause joint damage, while in osteoarthritis the joint swelling is usually the result of joint damage. Only when medical science began to understand the underlying mechanisms of RA – what factors caused the disease – did real progress begin in developing treatment options that could slow or even stop disease progression. Up until then, the best that could be said is that some treatments worked better than others, even though no one was totally sure of the reason. Of course, it makes sense that it’s important to understand why something is happening before you intervene to stop it. This would apply to fixing your car as much as to fixing your body. But while good mechanics tend to reason forward from the cause to the effect – your spark plugs are fouled with oil from a leak in the valve gasket, so that’s why your car is running sluggishly – many reasonably effective medical treatments have been discovered by accident, and been widely used without deep understanding of what exactly they were doing. For example, comfrey leaves have long been known to bring down swelling, although nobody knew why, and poultices of comfrey leaves were used by people with rheumatism to relieve the swelling in their joints. It worked, sort of. But it did absolutely nothing to prevent the disease from getting worse. How was RA treated before the current treatment methods were in place? Treatment was directed at the symptoms – pain, swelling, and stiffness. It should be no surprise that aspirin was a mainstay of treatment. At high doses, aspirin is not only an effective pain reliever – analgesic, as the doctors like to say – but quite an effective anti-inflammatory drug. The dangers of prolonged high-dose aspirin treatment, however, have been known for a very long time. In addition to its analgesic and anti-inflammatory effects, aspirin has two other potent effects. One is that it brings down fever – an anti-pyretic effect. And the other is that inhibits red blood cells from clumping together to form blood clots. This effect, the anti-platelet action, is very valuable in that it helps protect people from sustaining strokes and heart attacks. But it has a serious downside. The analgesic effect of aspirin is mediated by one of its mechanisms, which is that it inhibits prostaglandin production driven by an enzyme called cyclo-oxygenase (COX). Prostaglandins are the messengers of pain, so decreasing prostaglandin production also decreases pain. Excellent! Except that prostaglandins are also vital in protecting the mucous lining of the GI tract, especially the stomach. When the prostaglandin-inhibiting activity of aspirin is combined with its antiplatelet activity, that adds up to a considerably increased risk that people taking high-dose aspirin for long periods will have bleeding in their GI tract that won’t heal because the blood is too slow to clot! So treating RA patients with high-dose aspirin for years on end was definitely not a solution to the problem, even when other treatment options were scarce. 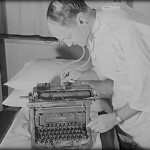 One form of treatment that became available in the years immediately following World War II were the corticosteroids. (There are not the same as the anabolic steroids that moronic athletes take to enhance their performance!) Corticosteroids were initially derived from the adrenal cortex of animals, and found to be highly effective antagonists of inflammation. Since inflammation was known to be a root part of the RA disease process, cortisone was a natural for treating RA. Once again, excellent! Except that long-term corticosteroid use was found to have highly negative adverse effects. These include brittle bones, kidney problems, elevated blood cholesterol, ophthalmic issues, and fragile skin, among others. So long-term treatment with cortisone was not really an option. Fortunately, other forms of treatment were available. Others include azathioprine (Imuran), sulfasalazine (Azulfidine), hydroxychloroquine (Plaquenil), and leflunomide (Anova). All of these are effective to some degree, and azathioprine and hydroxychloroquine are highly important in the treatment of other conditions – azathioprine in the treatment of autoimmune hepatitis and hydroxychloroquine as an anti-malarial. However, whether any of these can legitimately be termed a “disease modifying” drug when it comes to RA is a matter of controversy. They are unquestionably effective in reducing pain and inflammation. Whether the underlying RA diseases process is halted is another question entirely. But what about the NSAIDs? The NSAIDs – non-steroidal anti-inflammatory drugs – started appearing on drug-store shelves about 50 years ago. Strictly speaking, aspirin is an NSAID, but it was out there long before the term came into use – and the term is an obvious effort to make it clear that these drugs are not steroids and do not have any of the dangerous steroid side effects. A few of these became available early in the steroid period, for example, indomethacin, which was a powerful and effective anti-inflammatory, but afflicted with undesirable side effects. However, the NSAID era took off when ibuprofen (Advil, Motrin, and other trade names) became available over the counter about 30 years ago. Like aspirin, NSAIDs inhibit prostaglandin synthesis via the COX pathway; unlike aspirin, they do not have anti-platelet effects. Therefore patients who take these non-aspirin NSAIDs may be somewhat less affected by GI bleeding. But the long-term GI effects of NSAIDs are a legitimate concern. The COX pathway has become a source of great interest not only to doctors, but also to lawyers (and possibly Indian chiefs!) because of the discovery that there are two of these pathways, labelled COX-1 and COX-2. Most of the NSAIDs – ibuprofen, naprosyn, etc – are non-selective COX inhibitors, meaning that they interact with both pathways. But it turns out that while the COX-1 pathway is the one that produces the beneficial prostaglandins (as well as other necessary GI tract actors), the COX-2 pathway is the one that produces the nasty prostaglandins that mediate pain and inflammation. This valuable discovery led to the development of the COX-2 inhibitors – Vioxx (rofecoxib) and Celebrex (celecoxib). As nearly everyone on the planet knows, Vioxx hit a pothole very quickly, when it became known that in its clinical trials it had been associated with an unusually high percentage of cardiovascular side effects, including deaths from heart attacks and strokes. That’s where the lawyers came in, and Vioxx was taken off the market rather quickly after its introduction. Celebrex was also affected by CV events, but it has remained on the market. The controversy has not vanished, however. There are indications that all the NSAIDs may have CV effects. Does that mean that people with RA should stop taking NSAIDs? Consider this: there is an established statistical – and perhaps causal – link between RA and heart disease, so maybe the increased incidence of CVD in persons who take NSAIDs may be mostly due to the underlying RA disease and not so much to the NSAID. And perhaps this is also aggravated by the decreased level of activity in persons with RA. In any case, the discovery of the two COX pathways is potentially hugely important and may yet lead to the development of agents that reduce pain and inflammation without causing GI or CVD problems. In the meantime, some NSAIDs – e.g., meloxicam (Mobic) appear to be somewhat more selective for COX-2 than for COX-1 (meaning that it tends to block the production of the harmful prostaglandins more than of the beneficial prostaglandins), while good old aspirin is more selective for COX-1. What did treatment for RA look like when those were the choices? A widely-followed protocol back when the available options were corticosteroids, DMARDs, or NSAIDs, was known as the therapeutic pyramid. What that meant was that patients would be started on the drugs that had the fewest side effects and then more powerful drugs would be added as their symptoms got worse. In some cases, newly diagnosed patients with RA would be told to take aspirin “as needed,” which might amount to a dozen or more 325 mg tablets per day. The aspirin regimen might be supplemented with an occasional corticosteroid shot – usually prednisone – to help a patients ride out a crisis, or, sometimes, to give a patient an extra mobility boost for a special occasion, e.g., a grand-daughter’s wedding. And as the patient’s symptoms worsened, DMARDs could be added, singly or in combination. Some practitioners looked at this and decided that it made no sense. A rheumatologist named Daniel McCarty published a paper in 1990 with the feisty title, “Suppress rheumatoid inflammation early and leave the pyramid to the Egyptians.” This approach, emphasizing early aggressive treatment, has been followed, with much success, for more than 20 years. The philosophy was to do everything possible to stop the progression of the disease as soon as possible; then ease back on those most powerful drugs so as to minimize the adverse effects. A treatment protocol might call for some corticosteroid treatment right at the start, accompanied by DMARDs, which might be used in combination, so as to add the efficacies, but not the side effects, which were not the same for all DMARDs. When the disease progression was slowed, it might be possible to maintain the patient mostly on NSAIDs, while continuing careful monitoring to make sure disease activity had not ramped up. Methotrexate (almost always abbreviated to MTX) was first used, at very high doses, as an anti-cancer drug, but was found to be effective in RA in the 1960s. The way in which MTX fights RA is exceedingly complex; we can oversimplify it by saying that it inhibits the synthesis of certain molecules called cytokines that are active in the RA disease process. The use of MTX in RA patients had to overcome the initial perception that it was a highly toxic drug. This perception was fostered because in cancers, such as breast cancer and leukemia, it was given at very high doses, and led to severe liver toxicity. However, years of research revealed that, for the treatment of RA, MTX was highly effective at quite low weekly doses, and that most of the adverse effects could be mitigated by giving patients folic acid supplementation. MTX was approved for RA by the FDA in 1988, and quickly became the standard first-line drug. It is also used in several other autoimmune diseases. MTX can be said almost to halt the RA disease process, at least in terms of pain and inflammation. Many very careful clinical studies in the 25 years since MTX approval have shown that some RA patients treated with MTX remain in a state described as “low disease activity” and a few can be characterized as being in remission. No one is saying that MTX is totally benign. In spite of folic acid supplementation, there can be adverse liver side effects. Patients taking MTX should avoid drinking alcoholic beverages, and some patients experience hair loss. But compared with RA’s potential for causing life-altering disability and even shortening life span, MTX treatment is enormously preferable. While clinicians kept looking for practical and effective ways to treat patients with RA, back in the labs, scientists were trying to figure out what exactly was going on in the RA disease process. We said earlier that, in contrast with osteoarthritis, where the inflammation is the result of the bone-on-bone wear in the joints, in RA inflammation appears to be the cause of the deterioration of the affected joints. They identified certain cytokines that were abundant in the swollen joints, and one in particular, labelled tumor necrosis factor, was pinpointed as the one that was causing most of the damage. Tumor necrosis factor (TNF) is one of a very large number of cytokines that are active in the immune system. As the name implies, it is one of a group of molecules that are active in attacking and killing tumor cells. But, among its very large number of actions, TNF also attacks the smooth surface of the bones in joints, leading eventually to severe damage. This is an underlying mechanism of RA. Once TNF had been identified as a principal culprit in the RA disease process, clinical research turned its attention to potential TNF antagonists. Rather than limiting their search to artificial molecules, research focused on mimicking the activity of molecules generated in the body that might block the action of TNF. Initially, two pathways were identified. One was to duplicate a molecule that blocked the receptors for TNF, and the other was to create antibodies to TNF. The first pathway led to the development of etanercept, which was the first biologic, approved by the FDA in 1999. The second pathway led to the development of a number of so-called monoclonal antibodies (mAbs) to TNF. Currently, five TNF inhibitors are approved for the treatment of RA in the United States. Infliximab (Remicade, from Janssen Pharmaceutica, a member of the Johnson & Johnson group [JNJ]). Certolizumab pegol (Cimzia, from the Belgian pharma UCB). Several other mechanisms have been identified in the RA disease process, and other biologic agents have been developed to address them. Abatacept (Orencia, from Bristol-Myers Squibb [BSMY]) blocks T-cell receptors. Rituximab (Rituxan, from Genentech, a member of the Roche group, and Biogen Idec [BIIB]) is an antibody to B-cells. Toficitinib (Xeljanz, from Pfizer [PFE]), inhibits another interleukin, IL-17. You can tell which drugs are receptor blockers, because the name ends in “cept,” and which are antibodies, whose names end in “mab.” Drugs whose names end in “ib” are inhibitors through some other mechanism. All of the biologics are given by subcutaneous injection, except infliximab which is given by intravenous infusion, and tofacitinib, a relatively new drug, which is given orally. Differences in efficacy among the biologics approved for treating RA are far from dramatic, and it is not easy even for highly experienced rheumatologists to compare their efficacies, for the simple reason that there have been very few clinical trials in which any two biologics were compared head-to-head. Clinical trials usually report their results based on improvement from baseline, and since the patient populations can vary widely from one trial to another, the percentages of improvement cannot be directly compared. Given the difficulty in comparing efficacies, physicians often choose the drug they are most comfortable with, relying on their own experience. But since the efficacies appear to be similar – and the patient outcomes are good! – physician experience may be as good a guide as there is. Is there an essential difference between the biologics and the earlier drugs? The short answer is yes! The steps in RA treatment could be summarized as follows: NSAIDs manage immediate symptoms pretty well, and DMARDs do so somewhat better. MTX works much better, and also reduces overall disease activity. But even MTX does not totally halt the erosion of the articular surfaces of the joints, which is the underlying disease process in RA. The biologics do a much better job at preventing this joint damage from progressing. That being said, for some patients – repeat, some patients! – treatment with MTX, sometimes in combination with other DMARDs, can result in very good long-term outcomes. So, what is the usual treatment protocol for patients with RA? To some degree, this depends on the patient presentation, the treating physician, and the insurance company. Generally speaking, if a patient presents with what appears to be fairly aggressive disease, and if the physician has some experience treating RA (some primary care docs, especially in rural areas, do not), the drill would be MTX for three to six months, followed by a biologic, most likely one of the TNF antagonists. The patients would be X-rayed on presentation and then have follow-up X-rays at regular intervals, perhaps yearly, to monitor the joint spaces. Most patients do very well on this type of treatment – how well, and how treatment response is measured, we’ll come to in a bit. Some patients are not so fortunate, and in those cases, a decision has to be made. Depending on a number of factors, the patient might be switched to another TNF antagonist, or to one of the drugs that targets another pathologic pathway. These days, patients with RA are lucky (at least!) that there are so many treatment options available. But are these biologic drugs safe? RA is an autoimmune disease. In other words, the body’s own disease-fighting immune response is turned against itself. The biologic drugs are, in essence, aimed at interrupting that bit of the immune response that attacks the human body. But does it make any sense to tinker with the body’s immune response? TNF, T-cells, B-cells, interleukins – all of these have an important function in our body. Should we mess with it? A basic fact to keep in mind when the safety of biologic drugs is considered is that for just about every adverse effect of concern, patients with RA have a higher incidence than the general population. This is true for cardiovascular disease, all kinds of infections, malignancies, and other conditions. So it’s not easy to be sure whether it’s the drug or the disease that’s the cause. The best data about the safety of biologics comes from registry data, maintained in various countries and containing information of huge numbers of patients treated with biologic drugs. Although there are differences among the biologics, we can point to some cautionary signals. Biologics pose some risk of reactivation of latent tuberculosis, so patients need to be tested. Herpes zoster is a risk – shingles vaccines are recommended. The risk of some serious infections is slightly elevated. With regard to malignancies, the chief increased risk seems to be non-melanoma skin cancers. If you have looked at direct-to-consumer advertising of biologics – or any drug, for that matter – you have certainly been hit with an avalanche of warnings about side effects. These are required by the FDA, but most of the time their real significance is that the pharmaceutical companies are looking out for themselves. Under no circumstances do they want to expose themselves to the charge that they didn’t warn patients about a potential side effect. Should you take these warnings seriously? Of course! However – and this cannot be overemphasized – for the great majority of patients, the risk of non treatment is much, much greater than the risk of treatment for RA! One of the advances in RA treatment is the use of objective measures of disease activity. These have been developed by bodies such as the American College of Rheumatology and the European League Against Rheumatism (EULAR). They consider such variables as the number of involved joints, certain markers of RA that can be detected in blood samples, and the physician’s as well as the patient’s assessment of the disease status. These objective measures can be correlated with other ways of measuring disease progression, such as X-rays or ultrasound. Physicians are urged to track patients closely using objective measures, and to tailor their treatment on how the patient is doing based on these measures, intensifying treatment if the patient is not improving satisfactorily. Perhaps as a result of the availability of treatment choices that are quite effective as well as relatively safe, a considerable proportion of patients with RA are now assessed as being either in a state of low disease activity, or – hallelujah! – in remission! Finally, there is now considerable discussion of what to do when a patient is in remission. Among the possibilities being discussed is withdrawal of some or all of the drugs in the patient’s treatment plan. Today, the ultimate goal of treatment, acknowledged by the rheumatology community, is drug-free remission. How often this can be achieved is open to question, but that’s where rheumatology is aiming. I had the good fortune to attend a EULAR meeting in Copenhagen a few years back, and I heard one of the world’s most eminent rheumatologists (Josef Smolen) talk about his experience in treating RA over the past 30 years. He summed it up by saying that when he started in practice, it was not unusual to see a relatively young person, usually a woman, present with early aggressive RA, and to watch helplessly as her disease progressed, despite the treatment options then available, to the point where she was severely crippled, sometimes in less than a year. He finished by saying that physicians never see that any more. Crippling RA can now be prevented with near certainty. That matter-of-fact physician was obviously moved when he said those words, and this crusty old Doc Gumshoe is moved when he writes them. 32 Comments on "From Rheumatism to RA: A Basic Change in Understanding"
Perhaps you should look at Antares Pharma (ATRS). A new way of delivering MTX without visiting the doctor for shots. Appears that the efficacy of smaller doses of MTX is improved without the side affects of GI damage by using their injection device which has recently been approved by the FDA. I agree. I’d like to know if anyone else here can give more insight to ATRS. Thanks. I had what sure felt like RA for many years. Mostly my hands. I read somewhere that minocyclean or minocin in only the lederle ( original brand) could cure it. so I tried it when I was 55 yrs old and and now an 74 and no problems. My take is that RA is either viral or caused by a microplasma that minocin treated. Anyway my doc said it just reduced the inflamation. All I know is that it worked permanently for me although I do take monocin on occasion for other things.- My 2cents. What a great review! Thank you. I am a retired rheumatologist who began treating patients in the mid 1960s. Your review was like living thru all the misery and occasional joy of treating these diseases. From children temporarily deaf from high aspirin levels to adults dying from aplastic anemia secondary to gold, I saw all the complications. Your review is comprehensive and balanced and helpful to patients, their families and physicians. As a pharmacist, I find your article well researched and well written. A very good summary of the development of RA’s treatment protocol, and extremely useful for me when needed to explain to my patients. Thanks. Thanks for that Doc. Very interesting. My wife suffers from RA which fortunately seems to be reasonably well controlled by her daily meds. She also had breast cancer and I wonder if we’ll eventually find common causes at the root of these as well as MS and perhaps others? A grandfather of Natural Medicine is Jonathan Wright MD, (Tahoma Clinic). You can find considerable info and research by him on his website. Others are Mercola, Sears, Ornish, Jonathan Collins, Jerry Mixon (Longevity Medical Clinic) and Andrew Weil. KLH shows great promise as a carrier/catalyst in the development of an RA vaccine. Stellar Biotech is the company to research regarding KLH and its many potential uses. Thanks Doc for another informative article. The future of medical treatment lies mainly in helping one’s own body successfully defend itself and/or not go haywire (when one’s immune system fights against itself like in Krohn’s, Lupus, RA and other diseases). Thanks so much for another interesting and informative article. Before reading it, I knew next to nothing about RA. SBOTF continues to do well. I think Travis recommended this stock a few months ago. It’s an interesting company using sea creatures…limpets? for treatments. I just bought in again. Yes, I opened a small position in SBOTF on May 31. Up 132% even after recent pullback. Probably should buy more here. I forgot to mention a property of Anatabloc. Like most, but not all supplements, Anatabloc has not been accused of any side effects. Compare that to Enbrel. Enbrel scares me. E3ceprise, I just re-read your post and have dropped in here to say that you probably should try Anatabloc. It is a strong anti-inflammatory that I think can step in when the immune system is overdoing its job or other things cause excess inflammation. If you want to read all the theoretically possible side effects of all these medications you can look in any pharmacopeia or on line and easily find your answer. Alas, be fore warned, if you do that, it will probably put you to sleep or give you a headache 🙂 ! Your med. articles are the best. Can You please do the same for Chronic Fatigue Syndrome? Another theory as to causation of RA, cigarette smoking including 2nd hand smoke. Did you ever hear of Fen-Fen? Thank you so very much for your insights, sharing and just good “reads”. Best of luck ( hard to call it that) to you.